Rahul Dravid becomes the second batsman after Sachin Tendulkar to score 13,000 runs in the history of test cricket. This achievement was made in his 160th test in 277th innings. 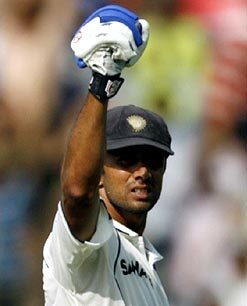 Dravid scored his 36th Test century in the second Test against the West Indies in Kolkata. Only eight batsmen have recorded more than 10,000 runs in Test cricket and three of them are Indians. Dravid,who has scored more runs in Test cricket than any other batsman this year, was named for the 'Polly Umrigar award for the best Indian cricketer 2010-11' on Wednesday 23 November 2011. With 209 wickets, Dravid also holds the record for the highest number of catches by a fielder in Test cricket. 0 Response to "Dravid completes 13,000 runs in Test Cricket"